Chile-based Si Studio’s gorgeous origami lamps were a big hit at this year's Milan Design Week. The oversized origami creatures were inspired by nature and made from simple sheets of heat-resistant paper meticulously folded into animal shapes. Each durable lamp casts a warm glow while bringing artistic design to any room. The gorgeous lamps are made from heat-resistant industrial polyester paper, which was initially engineered to be used for motor filters. Each sheet has been folded into sharp angles, points and shapes to create a variety of animal characters. Si Studio’s take on the chandelier was inspired by the natural migration of birds. 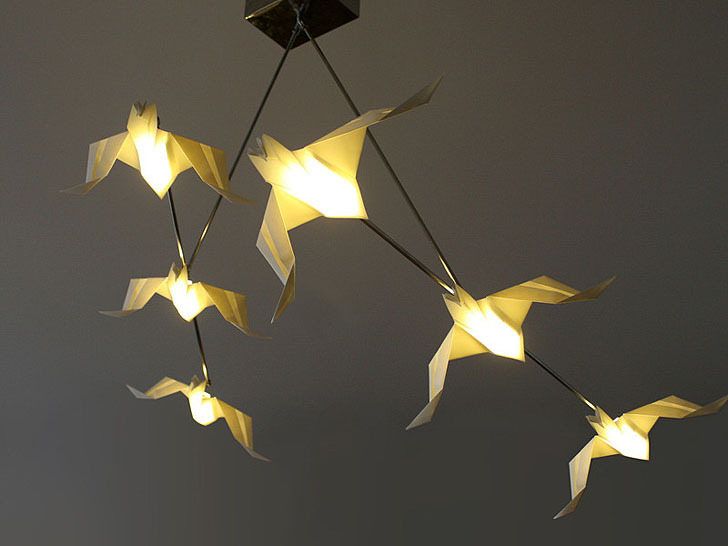 Aptly named the Migration Lamp, it features two arms that reach out to support six individual origami birds. The lamp mimics nature by joining the elements of the lamp into the natural V migration pattern that birds follow. The Migration Lamp is part of Si Studio’s larger series, which is titled the Origamis Hunter collection. The collection also features folded animal shapes that serve as glowing wall lamps. The collection doubles as cruelty-free hunter’s taxidermy trophies and consists of intricately folded rhinoceros, deer and goats. The animal head collection is also made from heat-resistant paper, which may at first look fragile but is actually durable and completely heat safe. The gorgeous lamps are made from heat-resistant industrial polyester paper, which was initially engineered to be used for motor filters. Each sheet has been folded into sharp angles, points and shapes to create a variety of animal characters. Si Studio’s take on the chandelier was inspired by the natural migration of birds. 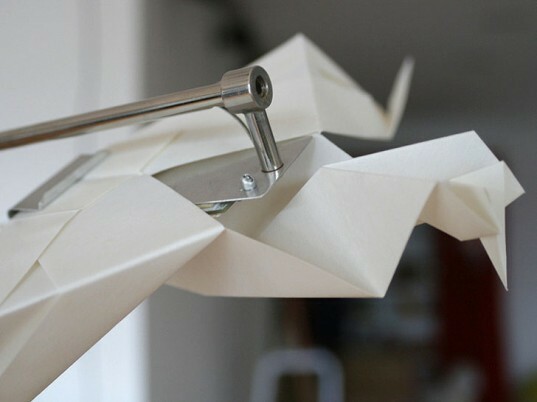 Aptly named the Migration Lamp, it features two arms that reach out to support six individual origami birds. The lamp mimics nature by joining the elements of the lamp into the natural V migration pattern that birds follow. The Migration Lamp is part of Si Studio’s larger series, which is titled the Origamis Hunter collection. 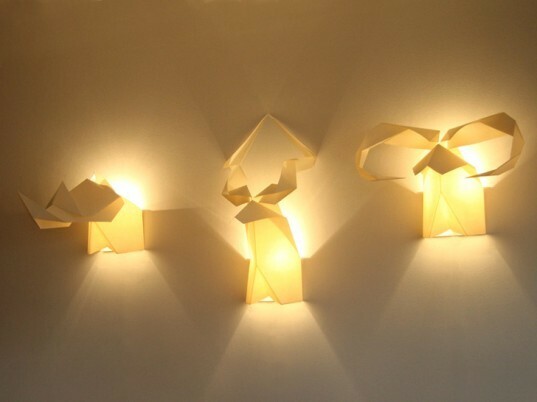 The collection also features folded animal shapes that serve as glowing wall lamps. The collection doubles as cruelty-free hunter’s taxidermy trophies and consists of intricately folded rhinoceros, deer and goats. The animal head collection is also made from heat-resistant paper, which may at first look fragile but is actually durable and completely heat safe.